When choosing new bindings, knowing about the different snowboard binding parts can help you decide which pair are going to be most suitable for you and will give you someting to keep in mind the next time you go binding shopping. The diagram below shows you what could differ from set to set. It is good to know how this component of your kit is made. The more knowledge you have before you head into the shop to spend your money the better. 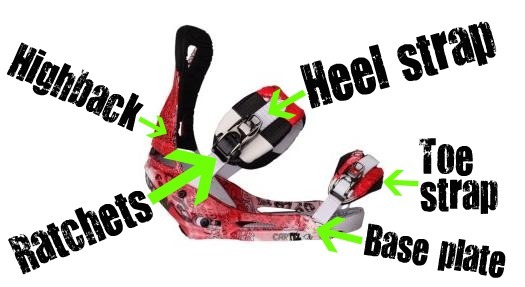 We hope this information on bindings has given you some more knowledge about how they are made. If you have any questions about the parts of snowboarding bindings available and want to know more then please drop us an email through the contact us page. JOIN THE CONVERSATION - WHAT BINDINGS DO YOU USE? Back to "Snowboarding home" from "Snowboard binding parts"
Back to "Snowboarding equipment" from "Snowboard binding parts"